Between 2007 and 2013, rhino poaching in South Africa increased by 7,700%. Rhinos, which are poached for their horn, aren’t the only victims of this illicit trade, which is driving many species of wild animals and plants to extinction: elephants are poached for ivory, tigers and leopards for their skin, pangolins for meat and scales, and iguanas are caught for the pet trade. Rare timber is targeted for hardwood furniture. 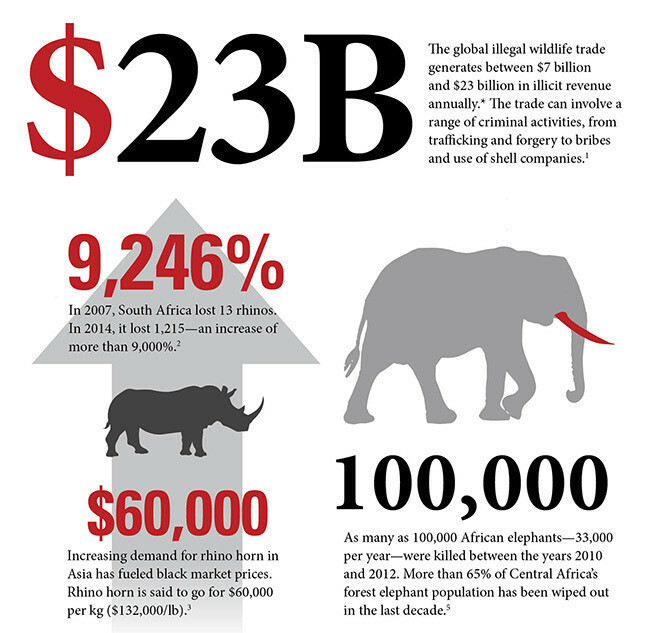 With a value of between $7 billion and $23 billion each year, illegal wildlife trafficking is the fourth most lucrative global crime after drugs, humans and arms. Trophy hunting is estimated to create around $200 million in annual revenue. Only 3% of the fees paid for the hunts reach local communities. In 2015, the United Nations General Assembly unanimously adopted a resolution for tackling illicit trafficking in wildlife. The Sustainable Development Goals specific targets to combat poaching and trafficking of protected species. That's quite some progress, but more action is urgently needed, because more than 7,000 species, in 120 countries, are at risk. Fighting this type of corruption requires civil servants, including park rangers, who are properly paid, trained and equipped. Along the entire supply chain, awareness needs to be raised and measures must be increased. Transportation and logistics is not only the backbone of a modern economy but also a key enabler for trafficking wild animals and wildlife products. Therefore, the transportation and logistics sector plays a critical role in identifying and eliminating risks along the supply chain. In light of the surge in wildlife crime, the industry has been taking a range of actions to break the chain between supply and demand. At the end of January 2015, TRAFFIC and the World Customs Organization (WCO), with the support of the United States Agency for International Development (USAID) and the Wildlife Trafficking Response, Assessment and Priority Setting (TRAPS) Project, convened a two-day consultative workshop. Delegates from shipping and logistics companies, airlines and courier and transport associations were seeking solutions to deter wildlife smuggling activities. In March that same year, representatives from logistics and transportation companies operating in China made a public declaration pledging their zero tolerance towards illegal wildlife trade. The 17 companies, which include EMS, DHL, FedEx and SF Express, account for 95% of the Chinese courier market. The same month, the Declaration of the United for Wildlife International Taskforce on the Transportation of Illegal Wildlife Products, which outlines 11 commitments to help bring an end to the illegal trade in wildlife, was signed by some 40 corporations, agencies and organizations, including Maersk Line, Kenya Airways, IATA and the World Customs Organization (WCO). Many airlines have banned hunting trophies: Air Canada, Air France, British Airways, Brussels Airlines, Emirates Airline, Etihad Airways, Iberia, KLM, Lufthansa, Qantas, Qatar Airways, Singapore Airlines and Virgin Atlantic Airways. Following the killing of Cecil the lion in early July 2015, Delta Airlines banned all lion, leopard, elephant, rhinoceros and buffalo trophies in the cargo holds; United Airlines and American Airlines later followed suit. US embargos are important. The person who killed Cecil, Walter Palmer, is one the estimated 15,000 American tourists who visit Africa on hunting safaris each year. Although he had a permit and was not charged with any crime, Cecil was an illegal kill. In June 2016, the International Air Transport Association (IATA) adopted a resolution on the illegal trade in wildlife at the 72nd IATA Annual General Meeting. IATA denounces illegal trade in wildlife and wildlife products, and calls upon the member airlines to consider the adoption of appropriate policies and procedures that discourage the illegal wildlife trade. Can new technologies stop poaching? Breaking the chain is important. However, it would be better to stop wildlife and forest crime at its root. Satellites, drones and internet live-streaming enable solutions which capture the crime taking place to inform law enforcement agencies and the general public in real time. Solutions like this could not only protect wildlife and forests, but also support important initiatives in many fields and areas, such as deforestation, illegal fishing and natural disasters. The development has already begun: Global Forest Watch is providing data and high-resolution alerts. Witness, established in 1992 by Peter Gabriel with the help of Human Rights First and its founding executive director Michael Posner, trains and supports activists and citizens around the world to use video safely, ethically and effectively to expose human rights abuse and fight for human rights change. Building new tools requires support from the private and public sector, international organizations and consumers. Until new high-tech solutions arrive, collaboration in fighting corruption and wildlife and forest crime along the supply chain needs to be tightened and strengthened. This month, leaders and experts are in Johannesburg for the 17th meeting of the Conference of the Parties to CITES. The participating parties are discussing a dedicated resolution on prohibiting, preventing and countering corruption facilitation activities. As Yury Fedotov, the executive director of the United Nations Office on Drugs and Crime, said: “We all share a responsibility to act where we can.” Hidden in fashion or furniture, as food or pets, the products of wildlife and forest crime find their way into our homes and lives, so we all have a responsibility to act.